The tree-lighting begins at 6 p.m. Nov. 30 in front of the Dare County Arts Council on Queen Elizabeth Street with choral and instrumental music from Manteo High School, Manteo Middle School, Manteo Elementary School and First Flight High School. Other entertainment includes Bill Rea, the Wright Tappers, the Island School of Dance, the Echoes of Heritage, Dare County School of Dance and the Community Choir. Following the musical showcase, Santa Claus arrives to help light the tree and meet with children at Magnolia Pavilion. 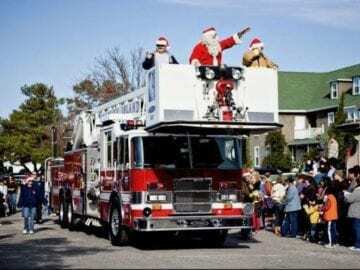 On Saturday, Dec. 1, the holiday celebration continues with the annual Christmas parade leaving Manteo High School at 10:30 a.m. Pre-parade entertainment will begin at 9:30 a.m. at the grandstand in front of the Dare County Arts Council featuring the Jazzmen, and Mistress of Ceremonies Della Basnight. Parade applications are now available online at townofmanteo.com or by emailing wickre.m@townofmanteo.com. After the parade, Santa will be available to visit with the children at the Winter Wonderland at the Manteo Elementary School, sponsored by the PTO. The 14th annual Holiday Tour of Homes presented by the Manteo Preservation Trust will be also be on Saturday, Dec. 1 from noon until 6 p.m. Tickets are $20, and are available at Outer Banks Distilling, 510 Budleigh St., beginning at 11:30 a.m. For more information about the Holiday Tour of Homes call 252-473-7336 or visit manteopreservationtrust.com. The town is also hosting a “Boats and Balconies” decorating contest on the waterfront and downtown. And there will be a decorating contest for homes and businesses within the town’s limits this year. Judging for the “Boats and Balconies” was on Thursday, and the winners will be announced at the showcase performance on Friday night. Judging for residents and businesses will take place on Monday, Dec. 10 and the winners will be announced on the town’s website and social media. Prizes will be awarded for all decorating contests. For more information email wickre.m@townofmanteo.com.